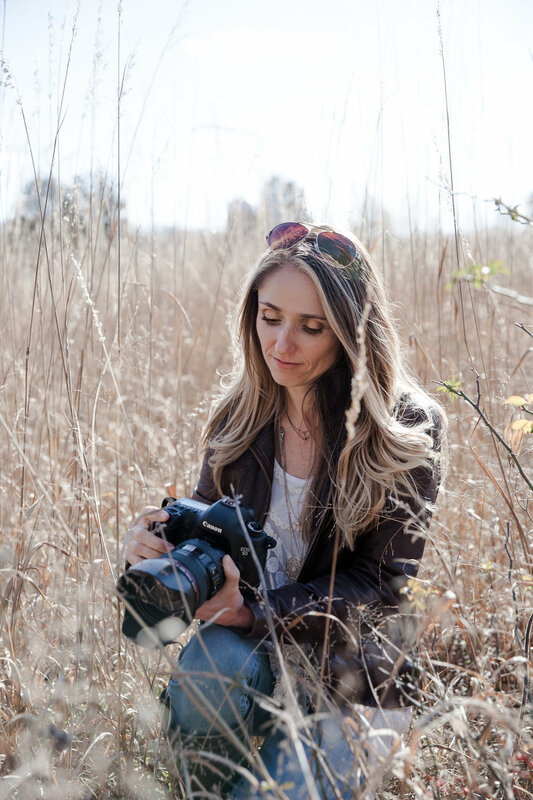 Sarah Kaupp was (and is) my own mentor in photography and taught me most of what I know about running a photography business. She has given me grace in my newbie-ness and in every change of style or shift in direction, she has continuously been a source of encouragement to me. At times I have found myself caught off-guard by her encouragement, because it feels so amazingly undeserved. CG: When did you know you wanted to be a photographer? SK: I always loved photography, but I knew I wanted to be a photographer full-time when I was pregnant with Ben. I wanted to be able to pursue something that I felt I had a strength in, something that I thought was going to bring people happiness, but also something that I could incorporate into my family's life. How long had you been seriously into photography when you made that decision to be in full-time photography? I had been pursuing my business part time for about a year and a half when I took the plunge. I had started doing sessions for people and I started trying to build a portfolio. Actually, I was seriously into portraits for a year and a half. Long before that I had been really seriously into landscapes, and nature, and things like that, but it was a little bit of a transition to get comfortable enough to start shooting people. What was your biggest fear going into full-time photography? That I wouldn’t make any money! Like, who’s going to hire me to take pictures? That it wouldn’t work and I’d have to do a 9-5 thing, and at that point I didn’t know what I wanted to do 9-5 anymore, because I had done the geography thing (which was my major), I had done the map thing, I had done this other sales position, and my heart just wasn't into it. I felt like I wanted to do something where my heart was in it, because then I would be better at it and excel at it. I also suddenly had an insanely strong desire to figure out a way I could help provide for my family but also be available for my family. There are two different kinds of days. One is where I get up, do the morning scramble with the kids, get them off to school, then I go off to a newborn shoot to spend a few hours snuggling with a little love, getting all these wonderful pictures for this mom to have when she’s older and - more importantly - for that baby to have when they’re older, and sometimes I get to bring my awesome assistant. And then I go get my little guy, spend the rest of the afternoon getting through some emails, hopefully a little bit of editing, and then I get back into the mom grind of homework, backpacks, and dinner…and legos. So that’s one of the days. The other day is when I wake up, do the morning scramble, get the kids to school, then sit in front of my computer and edit, edit, edit, edit. Then more emails, then more editing. Those days are really good for accomplishing. Those are good days for feeling like I’m getting things done, and the shooting days are good for my spirit. I think one of the things that attracts me to photography so much is that you have days where you’re administrative and doing things, checking boxes, and getting things done. But then you have those days where you’re shooting and you’re free; you get to be creative. Do people things. Yeah, and I love people, so those days are usually really good for my spirit. They cheer me up and they make me feel like myself. Those days I feel like myself. How do you balance growth as an artist with fulfilling client wishes? Anyway, it’s hard to say ‘No, I don’t really do that’ to people. In the very beginning I would try to [cater to them] and it just wouldn’t be me or be right, and I would do it poorly. So I decided that was crazy and I would just be true to my own style and my skills and my own vision. I gently guide [my clients] through what I think might be best. However, it is a balance. Not that long ago I had a mom with about 6000 props, and it was not really my thing, but she was so excited about them. At the end of the day I’m doing it for her, so in those instances when I know —for reasons I don’t understand— it means a lot to her to have those things in her pictures, I’ll make sure to get a few, and then I make sure I get the ones that are more in line with my vision. Usually they’re very happy to have the ones I made sure that I got, and then those are the only ones that I share. I try not to do that very often. I feel like with business in general (and this was the main thing at my old job, but it’s true, even in the way that I deal with other businesses), it’s just good to find a way to not say ‘no’. If you can do that while still maintaining your own ‘rules’ that’s awesome. I’m not saying to bend your business to please other people, but if you can figure out a way to not say ‘no’, that’s really helpful. One of the ways that I will say no without saying no is my pricing. I try to be very consistent. A good way to explain that to people is not to say ‘no I can’t do that’ but ‘you know, I really find it to be a better business model, for my clients especially, if I’m really consistent in my pricing’. And then they don’t hear a no; they realize it’s fair. You don’t want to think the next person got a better deal than you. It’s not ‘no’, it’s consistency. That is something I am very firm with. What is the number one piece of advice you’d give a photographer just starting out? I guess I could go back to what your questions were — Be true to your style, don’t do anything you’re not comfortable with, be consistent with pricing (that’s number 1), and price high. Don’t start low, find out what the market is and meet it. Don’t under cut any of the professionals because then you’re not going to appear professional to them. Professional pricing (and equipment) helps set the tone of your professionalism to the clients that are actually going to pay you. Price yourself professionally, be consistent, don’t do anything you’re uncomfortable with, and just talk about it all the time. Your new job is to constantly market yourself - not necessarily by having ads, but by talking to everybody. Slip it into the conversation. Especially when you’re starting out, so that people know. When I was starting out I thought I had to take all these classes, and [my mentor] said something to me that really made an impression. It was ‘why would you go to school to learn how to take pictures like everybody else?’ That stuck with me. And I think one of my strengths is that I don’t necessarily follow the all the typical photography rules. Not to say education and experience aren't important, but it's ok to embrace imperfection. If I have a photo that’s not necessarily perfect but has so much of the feeling I’m trying to convey, it’s okay. Photography - especially portraits - is about that feeling, so throw it in! The other thing she said was 'fake it till you make it!' Which I think we can all agree applies to all kinds of different scenarios in life. That's hard to answer. There are of course a zillion things I'd love to do! Things that would be great to check off a bucket list. But, in the end, my most meaningful dream is to have my boys grow up very secure in themselves, and to be good members of society; to have a happy family and this country-ish or mountain-ish home that I’ve either helped restore or I’ve just made my own, where I can still pursue my love of photography and spend time with my family. I don’t think I ever want to give up photography. Ever. I always want to have it in my life. I would love for my photography to be successful enough to support that vision while also doing good for others. Words really can't express how humbled I am that so many people have trusted me to help them create tangible memories with the people who matter most to them.